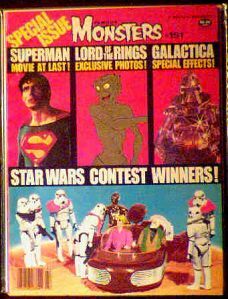 March 1979 issue of FM with features on Superman, Lord of the Rings, Battlestar galactica and more. Mint condition. This issue also features winners of the Star Wars contest. FM often ran contest over the years, allowing readers to win prizes by customizing toys and models sold in the back pages. It was a shrewd way in which to sell more toys and promote the mag at the same time. Website design and hosting by Sohodojo Business Services. Item 128 of 466 items displayed in viewer. 0 items in cart.